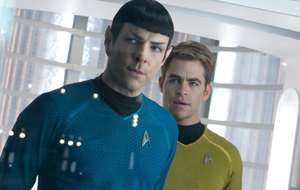 Following sneak previews in select IMAX theaters on Wednesday evening, Star Trek Into Darkness will roll out domestically on Thursday, May 16. Expectations are high for the sci-fi flick after the expectation-shattering performances from Iron Man 3 and The Great Gatsby. - The critically acclaimed 2009 reboot exceeded all expectations at the box office and became a huge word-of-mouth hit domestically, helping to expand the appeal of Trek to general audiences. - Reviews are strong and early reactions from overseas audiences are also positive. -There are no other wide openers this weekend. - Social network buzz has been consistently strong for several months, with recent trailers being particularly well-received online. - Sequels to films with strong mainstream reception and home video sales typically post bigger numbers upfront (see also the Iron Man, Transformers, and Pirates of the Caribbean sequels). - Opening the week before Memorial Day weekend has been successful in the past for the Star Wars prequels. - J.J. Abrams' drawing power continues to grow. The free publicity he generated for Trek after landing the Star Wars: Episode VII gig will definitely help. - The late release date change could skew opening weekend numbers one way or the other. - While older audiences and families will be the target crowds, will teenagers turn out? - The amount of competition in the market--before and after release--is significantly stronger than what the 2009 reboot faced. Check out our weekend forecast for the remainder of the top 10 in the table below.